Muḥammad Ḥusayn Kāshif al-Ghiṭaʾ (Arabic:محمّد حسین کاشِف الغِطاء) (b. 1294/1877 - d. 1373/1953) was a Shi'a intellectual and marja' of Najaf. He was a prominent figure in fiqh, rhetoric, Arabic literature, philosophy, hikmah (wisdom), tafsir and 'Irfan (mysticism). Kashif al-Ghita' was one of the first faqihs who applied comparative methodology in fiqh studies in the seminary center of Najaf. He has written numerous books especially in introducing Shi'a, his book Asl al-Shi'a wa usuluha (roots and principles of Shi'a), which was about introducing and defending Shi'ism, was translated to Farsi as A'in ma (This is our religion). Islamic unity and Islamic awakening were his concerns, and he has made efforts in introducing and defending Shi'a, for unity and proximity of Islamic sects. He was concerned in social and political aspects of Islamic society; besides he went on the battlefield and faced the English occupiers in World War I.
Kashif al-Ghita' was born in region of 'Ammara of Najaf in 1294 A.H.(1877) His descendants were Shi'a scholar and faqih. Shaykh Ja'far Kashif al-Ghita', his grandfather (d. 1228/1813), was the most prominent member of Kashif al-Ghita' family and a leading marja' and scholar in early 13th century (A.H) among Shi'a Muslims. Many of his children and grandchildren are considered grand scholars and mujtahid in Iraq. Shaykh 'Ali Kashif al-Ghita', His father (d. 1320 A.H/1902) and Shaykh Ahmad, his brother (d. 1344 A.H/1925) were also religious authorities (marja'-i Taqlid). Kashif al-Ghita' family members were in charge of Mu'tamad seminary center for over a century, which enjoyed a prospering time. Gradually it fell into ruin, but Muhammad Husayn Kashif al-Ghita' renewed and thrived it. The library of Kashif al-Ghita' seminary center was one of the biggest libraries in Najaf which embraced rare handwritten books. Kashif al-Ghita's behavior was highly admired. Despite numerous visits from different cities and huge number of letters from people and religious and social officials, he never hired anyone to do his personal work or opened an office. He replied the letters himself, even he sometimes answered the letters on its own paper and sent them back immediately. He paid meticulous attention to seminary students' situation, and made considerable efforts in order to get educational exemption for them. During World War I, following Sayyid Muhammad Kazim Yazdi fatwa against the English occupiers, Kashif al-Ghita' joined Iraqi soldiers. In his biography, he gave reports on the battles, English troops, defeat in Shua'ybiyah and withdrawal of Turks, the uprisings in Najaf, Karbala and Hillah, the death of English Marshall, siege and occupation of Najaf by English troops, arresting revolutionaries and saving a number of them from execution and also other historical issues of Iraq, especially those related to Shi'a Muslims' role. Kashif al-Ghita' was a frequent traveller to Iran, India, Syria and Egypt. When he travelled to each country, religious leaders and political officials were very fond of having meeting and talk with him, due to his influence and trustworthiness among Shi'a Muslims. Kashif al-Ghita' had a couple of travels to Iran. As he said, in one of his travel (1327 solar/1948), Muhammad Rida Pahlavi asked him for a meeting, but he rejected it. In another travel, two years later, Shah insisted on having a meeting, and finally he admitted a meeting with Shah and Lieutenant Razmara, minister of theology. He also had other meetings in Iran with Shaykh 'Abd al-Karim Ha'iri, Ayatollah Kashani, Mirza Khalil Kamari'i, Ahmad Shahrudi, Sayyid Husayn Qummi and many other notable scholars. In some of his travels to Syria and Egypt he met Sunni scholars and religious intellectuals who were the inspirers of Islamic awakening and Islamic unity. In 1350 A.H(1932), he was invited to a conference in Quds by Islamic Majlis of Palestine. In al-Aqsa mosque, in time of 'Isha' (night) prayer, among scholars and intellectuals of different Islamic sects including Rashid Rida, Sayyid Muhammad Zabarah and Shaykh Nu'man al-Uzma, Palestinian Mufti, Amin al-Husayni, and Imam of the mosque (leader of congregational prayer) both asked Kashif al-Ghita' to be the Imam of salat al-jama'a. He had many consultations with different Sunni influential religious figures. Kashif al-Ghita' was not publicly a marja'-i Taqlid among people. After his brother, Shaykh Ahmad al-Kashif al-Ghita', and Ayatollah Sayyid Muhammad Kazim Yazdi passed away, despite common Marja'iyya of Sayyid Abu l-Hasan Isfahani, Kashif al-Ghita' was marja' of some Shi'a Muslims in India, Iran, Afghanistan, Muscat and Iraqi tribes. Kashif al-Ghita' died in his travel to Karand, Kermanshah, in Iran in 18th of Dhu l-Qa'da, (1373 A.H/1954). His body was moved to Najaf, and it was buried in an honorable funeral ceremony which was held from Najaf to Wadi l-Salam Cemetery. His admirers in different cities of Iran, Iraq, Pakistan, Lebanon and many different countries, held memorial ceremonies for him. Muhammad Husayn joined seminary center of Najaf at the age of ten. He started learning Arabic literature along with learning Hawza studies. At the age of 15, he wrote a book on his ancestors, called Al-'Abaqat al-'Anbariyya. When he was 18, he attended Kharij Fiqh studies (advanced studies to become mujtahid) of Ayatollah Sayyid Muhammad Kazim Yazdi and Ayatollah Akhund Khurasani. He learnt Hikma, Philosophy, Tafsir and 'Irfan along with fiqh and Usul, from eminent teachers. He also studied Masha'ir, 'Arshiyya, commentary of Hidaya, Asfar, commentary of Usul al-Kafi, Fusus, Nusus, Fukuk and poems of Mowlavi and Jami. Kashif al-Ghita' was educated by notable teachers of Hawza of Najaf, including: Mustafa Tabrizi, Mirza Muhammad Baqir Istahbanati, Ahmad Shirazi, 'Ali Muhammad Najafabadi, Mulla 'Ali Asghar Mazandarani, Haj Aqa Rida Hamadani, Muhammad Taqi Shirazi, Sayyid Muhammad Kazim al-Yazdi and Muhaddith Nuri. It's said he was deeply under the spiritual influence of Muhaddith Nuri. 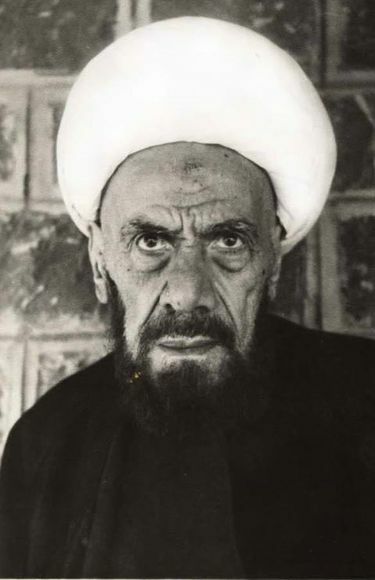 Kashif al-Ghita' took some Kharij fiqh and Usul courses from Ayatollah Sayyid Muhammad Kazim Yazdi and Ayatollah Akhund Khurasani to become mujtahid. He has written a commentary in four volumes on al-'Urwa al-Wuthqa by Ayatollah Sayyid Muhammad Kazim Yazdi which is supposed to be the first commentary on this book. In numerous years of his teaching, he has taught Ayatollah Sayyid Muhsin Hakim, Ayatollah Muhammad Jawad Mughniyya and Ayatollah Muhammad 'Ali Qadi Tabataba'i, former Imam Jumu'ah of Tabriz. Kashif al-Ghita' has written over 80 books and articles; however most of them are not published yet. Considering his literary abilities, his texts are enjoyable for Arab readers. His writings are penned in different subjects, including: Shi'a fiqh, gloss on al-'Urwa al-wuthqa, commentary on Tabsira al-muta'allimin and Wajiza al-ahkam. In addition, he has written works on Kalam and theological subjects, in defending Islam and divine religions confronting new theories like Darwin theory. Some of his writings are about introducing and defending Shi'ism, like Asl al-Shi'a wa usuluha. Kashif al-Ghita' has corrected and explained literary books and poetical works; besides he was an expert poet. He also composed poems as an answer to the questions raised by opponents on Shi'ism, like a poem in rejecting Qasidah poems of Shukri Alusi which was against Imam al-Mahdi (a). Al-Ayat al-bayyinat, criticizing Wahhabis' and Babi's theories (1345 A.H/1927). It seems comparative methods were not considered by preceding faqihs prior to Kashif al-Ghita', among different Islamic theological sects. Faqihs of Najaf chose one of the well-known texts of Imami fiqh for their main reference, and then they wrote commentary, revision and gloss on it. Earlier, Shi'a faqihs never referred to Sunni fiqhi (jurisprudential) books or even write commentary and gloss on it, in order to make a comparison between Sunni and Imami Shi'a book on fiqh. In Tahrir al-Majallah, Kashif al-Ghita' compared Hanafi and Shi'a fiqh. According to Al-Ahkam al-'Adliyya of Ottoman government, this book is considered as one of the first effort in comparing Shi'a and Hanafi fiqh. Al-Ahkam al-'Adliyya was taught in most of the Islamic and Arabic colleges, which is considered as one of the most important sources in fiqh and Islamic law. It is also the main source for judges, law scholars and specialists of the field. Kashif al-Ghita' pointed out the fiqhi value of this book and admired efforts done by other religions' faqih. He stated, we appreciated the efforts have been made by others, while all of our attention is toward God and he promised decent rewards to all people. So if any notable Muslim faqih, make efforts in ijtihad, he will be paid back with blessing. Kashif al-Ghita' issued several innovative fatwas in fiqh. It's said his intellectuality is related to his social attitude, travels, association with contemporary world and familiarity with issues and necessities of social life of the time. One of the controversial and audacious theories that Kashif al-Ghita' declared in seminary center of Najaf was allowing decent (non-sinful) music. He considered music as a valuable art which is one of the elements of life and an obscure gift for most of people. Kashif al-Ghita' believed: "While there are some unchangeable Ahkam (Islamic laws), some of the Ahkam need to be changed considering logical and rational requirements and also Shari'a necessities. However many of mujtahids did not have the skills and ability in changing and altering Ahkam, so they remained strange and irrelevant to their Shari'a goals." Kashif al-Ghita' was the first mujtahid who gave the right of divorce to the women whose husband suffer from tuberculosis; he believed such women can get a divorce without their husbands' permission, while according to Shari'a only men have the right to divorce. It seems Kashif al-Ghita' came to conclusion considering the lack of haraj (hardship) principle, according to the verse: "Ma ja'ala alaykum fi al-din min haraj" (Hajj/78)(Allah has laid upon you no hardship in religion). Considering women's right was another aspect of his intellectualism. While he emphasized on matrimonial rights and rising of virtuous future generation, Kashif al-Ghita' advised women to learn reading and writing, which was hugely significant, considering the social and historical condition of Iraq. He advised men to respect their women, as their life companions; he believed men and women have equal rights. Kashif al-Ghita' declared God didn't limit reasoning and maturity only to men, also the riwayat mentioning deficiency in women's reasoning are ascribed to their experimental reasoning, not to their instinct reasoning; although experimental reasoning can be acquired through frequent relations, trades etc. Some researchers believe Kashif al-Ghita' is one of the revivers of Islamic Kalam knowledge. Kalam has originated in the first century (A.H) and flourished in the fifth century, however it concerned outdated and old theological issues up to recent time. In the past century, Kashif al-Ghita' tried to renew Kalam discussions, in the light of new scientific changes and discoveries which caused uncertainty among naive and weak-willed believers. On the verge of young ages, he wrote Al-Din wa al-Islam on new Kalam discussions, while only two of its parts have been published yet, and the other two parts remained hand-written. In the first part, he generally explained the truth of religion and the necessity of religion for mankind. In the second part, he mentioned the truth of Islam as the factual religion. In addition, he remarked new subjects in order to reject the atheists and materialists' beliefs, and also those mubashirs intended to cast doubt on prophethood of Prophet Muhammad (s) and insult Islamic beliefs. Considering the new approach toward Kalam, some researchers believe Kashif al-Ghita' was the pioneer Shi'a scholar among other Muslim intellectuals, except Muhammad 'Abduh, whose book Risala al-Tawhid, made way for the new era of Kalam. Kashif al-Ghita' had extended relations and connections with Sunni and Shi'a scholars of different Islamic countries. As he said, his efforts have made positive changes on Sunni's attitude toward Shi'a Muslims. Soon after he returned to Najaf, a group of religious representative of Palestine, including Sayyid Muhammad Amin al-Husayni, travelled to Najaf; they also visited Holy shrine of Imam 'Ali (a). Asl al-Shi'a wa usuluha is a book written on history and Kalam, which is about the origins and introduction of Shi'ism in Arabic. In his book, Kashif al-Ghita' tried to retell the history of Shi'a and principles of ijma' among Shi'a scholars. He also intended to dispel doubts and demonstrate that Shi'ism lacks exaggeration and forgery. In addition to dispelling the doubts on Shi'ism, he tried to modify Sunni scholars' attitude toward Shi'a. He emphasized, presenting the differences between Shi'a and Sunni is not intended to make the division between Islamic sects deeper. The book starts with a long introduction and then explains the historical origins of Shi'ism, Shi'a principles, Shi'a attitudes toward fiqhi and shari'a issues including: prayer, fasting, haj, zakat and nikah mut'ah, judging, hunting, dietary and drinking. The last part of the book is about some important Kalam issues and Shi'a necessities including Bada' and Taqiyya. Asl al-Shi'a wa usuluha was published in 1351 A.H (1932) in Sayda, Iraq, for the first time. A'in ma (This is our religion) is the most famous translation of this book in Farsi, penned by Ayatollah Makarem Shirazi, in 1346 in 415 pages. Kashif al-Ghita', Muhammad Husayn. 'Uqud Hayati. Najaf: Madrasa wa Maktaba al-Imam Kashif al-Ghita', 1433/2012. Arsalan, Amir Shakib. Hadir al-'Alam al-Islami. Beirut: Dar al-fikr, 1973.